bePilates: #Pilates Roll-Up. Yep, we love it. The #Pilates Roll-up is a classical mat exercise that challenges the abs and is a great exercises to perfect coordinated breathing. Balancing abdominal strength with spine mobility is essential - if this is the exercise that makes you swear in your Pilates class. Yes, your teacher can hear you. Try the same action but in reverse, with control. Rolling down is a bit easier than rolling up. Give it a try! 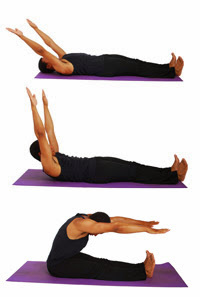 You can also then try rolling up, but instead of starting with legs extended like the handsome guy to the in the picture, bend your knees so your feet are flat on the floor. As you roll up, extend your legs out to the end position. Voila! You'll be rolling up in no time!